CAMEL PARK SUNNY BEACH IS UNIQUE IN ITS KIND. It is the only Camel Park in Bulgaria & Eastern Europe. Located only 5 minutes from Nessebar and 10 minutes from Sunny Beach. Come and meet our 12 very friendly camels which are our biggest attraction , as well as our ponies, donkey, rabbits, exotic birds and other animals. Enjoy a cup of tea, coffee, a beer or a meal in our restaurant overlooking to the bay of Sunny Beach. 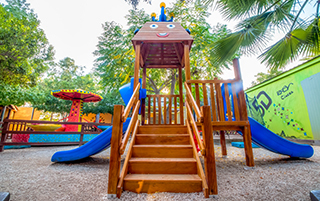 Let your children have fun in our playground. We organize birthday parties and other special events. Have a special day with the family with us. 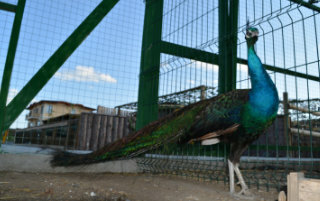 Camel park Sunny Beach Bulgaria a fantastic day out. The park is so clean the staff so friendly even the Camels wellcome you. Mike the camel does a little show for you if you give him attention.....its a must visit! Unforgetable day! Страхотно местенце,дружелюбни животни и отличен персонал.Силно препоръчвам посещение. Super! I recommend to all. Wow, this place is amazing, so clean, no smell from camels, animals very well looked after. Staff are so helpful and friendly. A welcome addition to sunny beach!! Would recommend to everyone of all ages and very family friendly with small play park and shelter area. Cannot recommend this place enough. Well done!! Wow what a lovely place, arrived by taxi not knowing what to expect, place is newly built, exceptionally clean. They asked why we hadn't requested a free pick up, we didn't know they offered this. We had a guide who spoke excellent English who showed us around and told us all about the camels and other animals and told us all their names and ages, we did the camel ride too! Lots of photos taken, good refreshment facilities and a free ride back to our apartment in Sunny Beach. We also got free food to feed the camels and a complimentary photo. Everyone was really friendly. Едно уникално място с много усмихнати и приветливи собственици и персонал.Райски кът в света на камилите.Благодарим ви много за всички емоции и този необикновен ден.Очаквайте ни отново и то многооо скоро. We went here today and everyone there was so friendly. I paid for both me and my daughter to ride the camel but my daughter was to wary about doing it. They were so helpful trying to ease my daughters worries. But she choose not to go on a camel. We didn't expect a refund as it wasn't there fault she didn't want to do it. But when we went into the cafe we got a little camel teddy and ice cream and cuppa and they said no charge because of my daughter not going on camel. Then we asked them if they could phone us a taxi to nessebar but the boss took us to nessebar and wouldn't take any money of me. Couldn't wish for a better place to visit. All the other animals there were so cute and they were all looked after so well aswell. Definitely recommend to anyone to go visit here. Don't usually write reviews for anything but we had such a great time here it deserves a great review. The staff are very friendly here very helpful and a lot of reassurance to ensure you are okay. The camels are well trained and very friendly the stable and general areas are kept clean all the time. The camel ride was fun and enjoyable for a first time experience, photos were taken during the ride and offered at 5lv a photo which ain't a lot, fun feeding the camels and seeing them do some tricks with a the trainers. They have refreshments and a sitting area to enjoy them, very clean and all refreshments are cheaper than the resorts and supermarkets around sunny beach. Overall a very honest and enjoyable experience. Its very very beautiful place !! And very friendly human!!! Great place to visit! Great experience for everyone! Great very friendly and helpful stuff! Thanks for the hospitality! There is plenty of other things to do other than riding or feeding the camels to donkey and pony rides!